6 March 2017 // Millions of people with disabilities face barriers in their daily life routine: withdrawing money from an ATM, entering a bank, a school, a university or any public building, using the metro, issuing a ticket, buying something online etc. Concerning this, the European Parliament is currently discussing the European Commission’s proposal for the European Accessibility Act, which was supposed to be an important advance in the improvement of the accessibility of products and services in the European Union for all citizens. However, the Committee on Internal Market and Consumer Protection (IMCO Committee), which is the responsible Committee for the European Accessibility Act in the European Parliament, published a very worrying draft report. The recent briefing is dramatically watering down the proposal for the Act, blocking a real positive impact and change in the lives of EU citizens. 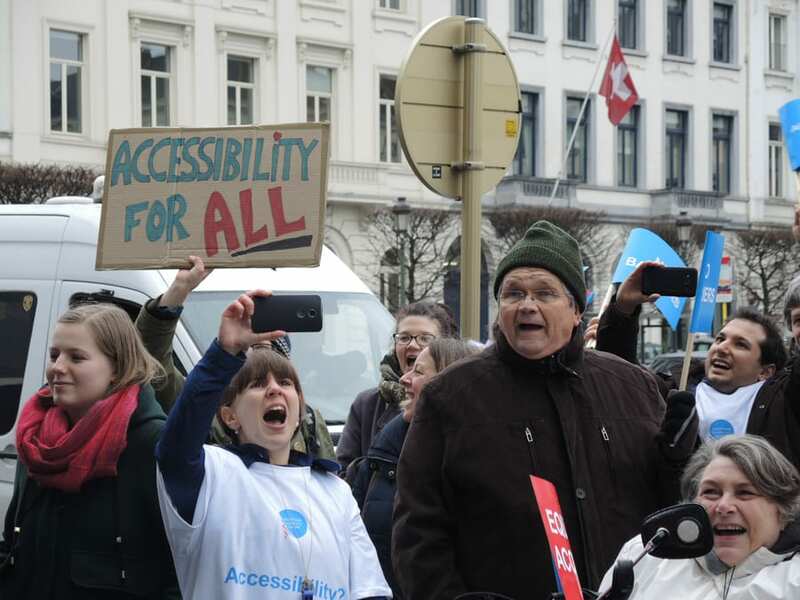 For that reason, IF joined today the demonstration organized by the European Disability Forum in Place du Luxembourg (Brussels) calling for an strong and ambitious European Accessibility Act. The demonstration was supported by MEPs Helga Stevens, Keith Taylor, Konstantina Kouneva, Igor Šoltes and Morten Løkkegaard, who is the rapporteur on the IMCO meeting in the European Parlament, which took place after the demonstration. It is important to create accurate European standards about accessibility and, in this respect, the negotiations with regard to the admendments will start tomorrow March 7. Thank you very much to the European Disability Forum for organizing the protest, to all the MEPs, organizations, civil society and experts for joining us today to promote a fairer European Union for all.